My name is Jessica Faurote, and I teach kids in grades 6, 7, & 8. A few weeks ago, one of my students asked me if we could "do something for people who don't have clean water". I was surprised and impressed with the request. I spoke with this student's family and learned my student's father had actually experienced this growing up in Mexico. 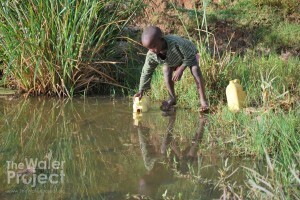 He would get up every day at 2 am and walk to get fresh water. The day's clean water supply would quickly be exhausted later in the morning. I was touched, to say the least. Today, I am currently helping my student and his classmates fund raise at school for The Water Project for the next two weeks. My student has already made the first donation of a few dollars from his own monies. My students and I will be doing The Water Challenge and will also be doing a school bake sale. This page is my own personal effort to help my students help others in need. Donations will be accepted here until November 30, 2013. In this month of thankfulness for all of your blessings, please help me share those blessings with others. 11/25/13 Dennis Faurote $46.00 keep up the great work! 11/10/13 Suzy Fuelling $46.00 Bless the students and their teacher who are helping to make a difference in the lives of those less fortunate. I am proud and honored to contribute to such a wonderful project.